Achieving the SDGs is a complex and challenging task to say the least, but Australia can make the most impact by focusing on climate action and global partnerships, say researchers. Australia will join the 71st United Nations General Assembly in New York this week. Some of the discussion will focus on progressing the 17 Sustainable Development Goals (SDGs), as agreed at the UN last year. Australia is a signatory to the goals, but it is difficult to know where to begin, as the goals are further broken down into 169 targets. These range from eradicating extreme poverty to developing measurements of progress on sustainable development. But new research from the University of Queensland reveals that actions on climate change (SDG 13) and global partnerships (SDG 17) are likely to influence all other efforts by Australia to achieve the other SDGs. 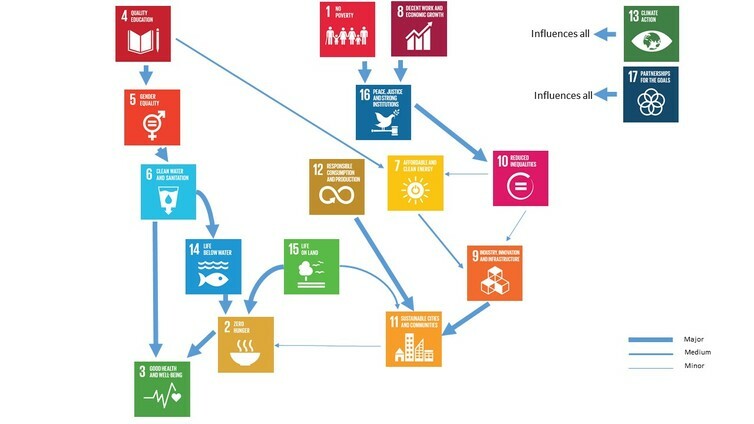 The SDGs form part of the UN development agenda, Transforming Our World: The 2030 Agenda for Sustainable Development, released in September 2015. Unlike the preceding UN Millennium Development Goals, which ran until 2015, the SDGs apply to all countries and citizens to create a common outlook, irrespective of the country’s level of development. The new goals are to be achieved by 2030. The Australian government has emphasised the role of the SDGs in reinforcing economic growth, development and investment in the Indo-Pacific region, and has assigned the SDGs to the portfolios of Foreign Affairs and Trade (DFAT), and Environment. Australia’s support for the SDGs is laudable. But the focus on international trade and investment, with responsibilities placed in only two portfolios, limits Australia’s potential for significant social, economic and environmental improvement on the SDGs at home and abroad. Actions on climate change and global partnerships are likely to influence all other efforts by Australia to achieve the other SDGs. Part of the challenge of the SDGs is their complexity and the way they link together. This may explain Australia’s limited approach to date. To help navigate this web of goals, we mapped the most influential goals. We found the goals that affect all the others are climate action (SDG 13) and global partnerships (SDG 17), as shown in the figure below. Without these, the other goals are very difficult to attain. For example, the increased intensity of extreme weather events due to climate change will likely make it harder to achieve clean drinking water under SDG 6. In droughts, less water is available, and in floods, the water is often contaminated. Both events result in the proliferation of diseases. These findings also identified that the goal for health and well-being (SDG 3) is the ultimate goal: every other SDG contributes towards this outcome. For example, a woman who has given birth to a daughter cannot achieve optimal physical, social and mental well-being for herself and her child without proper nutrition (SDG 2), access to clean water and sanitation (SDG 6), gender equality (SDG 5) and adequate financial resources (SDG 1). We also found that within SDG 6, implementing the integrated water resources management target (6.5) enables the other SDG 6 targets to be met. Australia’s Murray-Darling Basin is a good example of this type of approach. There, states negotiated across borders to reduce salinity, minimise extractions and improve water quality. Linking together these goals will require high-level government coordination beyond merely the DFAT and environment portfolios. Our policy analysis found that no single portfolio can take responsibility for the entire set of 17 SDGs – and that all 21 government departments have more than one SDG relevant to their responsibilities. Australia’s ability to progress the SDGs in Australia and overseas is likely to be more attainable with the involvement and cross-collaboration of other portfolios. The UN SDGs are an opportunity for Australia’s efforts towards sustainable development to be recognised on a global stage. To achieve progress on this complex agenda we have to understand that climate action and global partnerships are crucial to sustainable development and ultimately to health and well-being. Nina Lansbury Hall is Sustainable Water Program Manager, Global Change Institute from The University of Queensland; Dani J. Barrington is Lecturer, Global Change Institute, Honorary Fellow, School of Public Health, from The University of Queensland, and Russell Richards is from The University of Queensland. This article was originally published on The Conversation.